I’m not what you would call a Sci-fi buff, I’m pretty sure I’ve never read a science fiction book but I do like the odd science fiction movie from time to time. Not just any old one though only the big ones. Things like Star Wars, The Matrix, Star Trek, the Aliens films and that one about Salmon Fishing in the middle east with Kristen Scott-Thomas. One theme that runs through the biggest and most successful science fiction films is the human ability to mess about in the far galaxies traveling faster than the speed of light fighting space aliens with ray guns. Clearly this is something people would like to be able to do and the reason these films are called ‘science fiction’ as opposed to documentary features is that as yet we have been unable to master firing a rocket ship full of live people to the far end of the universe. I believe we could have been doing it by now, but our technological advancement was hamstrung for about a thousand years, right when we should have been starting some basic work on flux capacitors or at least the rudiments of understanding how lighting small fires near highly explosive gases could one day power an engine. We didn’t though. We as a species had other pressing issues to focus upon. Our primary concern was not burning in the fires of hell or being nailed upside down to a tree for doubting the opinions of powerful people in sackcloth or expensive robes who were seen carrying funny symbols from ancient folk stories. You see it all started terribly promisingly, our quest for surfing the galaxies by, say, 1765. The Ancient Persians were incredibly advanced as a civilisation, making pretty things out of natural resources and fashioning trinkets and gadgets from gold or precious metals. Building vast cities and being the cradle of scientific development while Europeans were still having wrestling matches over raw meat while dressed in animal skins. The Ancient Egyptians, we all know what they did, building great pyramids aimed at the sky. The Aztecs, we’re pretty sure they were actually inviting space men down for tea and human sacrifice, while also building incredible temples, now fallen into ruin. The Romans, the ancient Greeks, all of them swiftly creating science, discovering new theorems and inventing calendars, and putting long complicated names to unusual but useful things. But around 500-600 or so AD. All this cleverness, creativity and science ground to a bit of a halt, very little was achieved of any significance for the next 1000 years apart from making new weapons. What happened was the middle ages, also known as the dark ages. Organized Religion turned up. Oh religion had always been around in some minor form or other, but it was a largely pagan thing, some paranoid people praying to various gods or making sacrifices to the sun to make sure the maize grew properly next year. That sort of thing. Putting stones up in a field in a specific order or being nice to trees. None of it really had any impact on people not actually joining in with each others personal dalliance with their god of choice. We know now there was of course some well recorded genocide and butchery in the name of various deities in the middle east, but largely confined to a small region and nobody had much concern for this outside the tribal areas largely covered in sand. Somehow though, thanks to an apparently charismatic carpenter and some impressionable people in dusty towns beside the Mediterranean sea, we had a creator of the universe story catching on like wildfire. People liked a good story well told in those days and had a tendency towards blind acceptance of a convincing narrative. Books were in short supply you see. There was another version of the same story catching on as well after a bloke from another part of the middle east spent some time in a cave and came out with some new ideas on how to reinforce intolerance, sexism and bigotry to further a cause. Nobody is really sure how these two diverse versions of the same story caught on but I point the finger at Roman Emperor Constantine for allowing one of the folk stories of a creator of the universe to become the preferred religion of the major super power at the time. If you are unfamiliar with the Constantine story you may like to research it yourself, it’s a good one. It seemed to work better for him than praying for personal immortality or just success in battle to wooden figurines being set on fire in a ceramic bowl maybe. To cut a long story short, power is nothing if you don’t wield it and given the popularity among the new ruling elite of this new religion. Catholicism, they called it eventually. New powerful ways of controlling the populace had been presented to those who needed to control them. The unfortunate souls, literally apparently, who aren’t in charge of anything, you know, serfdom, slaves, minions, soldiers, farmers, metal workers, thinkers, lepers and the like have to behave themselves of course. Revolution of the masses was still frowned upon by those most likely to be revolted against. People who weren’t part of the ruling establishment but subjects of it had new motivations for appropriate behaviour to get to grips with. After all in those days subjugation of subjects was more popular with those in charge than democracy, which hadn’t been invented yet. The motivations for correct thought and behaviour where no longer just the business end of a whip, thumbscrews, iron maidens or being nailed upside down to a tree, but eternal damnation in the fires of hell by the creator of the universe. That’s a scary concept for a simple uneducated mind to grasp. What happened next were a series of inquisitions, you’ve heard of the inquisition of course, Monty Python made quite some mileage out of the ‘Nobody expects the Spanish inquisition’ gag. It’s worth noting that they were incorrect technically as everybody expected the inquisition. The inquisition made appointments to see you. So for several hundred, almost a thousand years of humanity from 500-600 to 1650 or so AD. Being creative, scientific, or inventive, the things you needed to start with if you are to design a flux capacitor or a warp drive had an alternative name, heresy. Heretics fared badly in the middle ages. Usually a fate worse than a fate worse than death to quote Blackadder. Ask Galileo how his incredible science and invention worked out for him, or read about him instead. You know who he is, widely being credited as being the ‘father of science’. He was imprisoned for life for heresy by our friends from the inquisition. This was probably discouraging for other potential fathers of science in the vicinity. Still none of this is terribly cheerful and around 1650 the best period in all of history arrived called ‘The Enlightenment’. This basically was a period when creativity, reason and independent thought finally challenged superstition and intolerance. Clever people started to openly discuss the manner of life, the universe and all sorts of things The general consensus was that oppressive religious intolerance was not really helping anyone. You can do your own further reading now as part of the progression from ‘The Enlightenment’ was the industrial revolution which gave us an internet and smart phones to enable us to look up all the information about everything in the world. If they had started this process back in 650 rather than 1650 we would certainly be making phone calls back home from our front seat on a starship heading to another galaxy on holiday. I don’t think that’s all that far-fetched. Certainly not science fiction. Who knows. Maybe that creator of the universe likes it’s peace and quiet in a galaxy far far away and just doesn’t want people turning up asking awkward questions, you know, doesn’t want an unexpected inquisition. It’s worth noting, given current events, that the enlightenment started in France. Absolutely brilliant – I am lol 🙂 Shared! Excellent. Such controlled writing. And spot-on with your argument! I love this essay. Thanks Marlene! 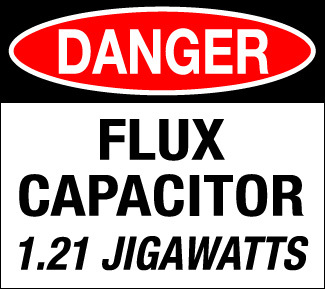 I want a flux capacitor!